There is more than one way to create a torn edge effect with paper. In this layout I have used two different methods. Try incorporating them in your pages for a fun, distressed appearance. This layout was created using Daisy D's Icy Blue Plaid paper, Patchwork Chocolate Plaid paper, KI Chic Plaid paper, Chatterbox Bunkhouse Ranch Flowers paper, brown plaid ribbon, three brown brads, small green alphabet stickers, Pebbles Inc Make A Wish Accents stickers, Pebbles Inc Antique Circle Tags stickers and Doodlebug Designs Lily White Alphabet stickers. Use the Icy Blue Plaid paper as the background. Cut a 1cm strip of Patchwork Chocolate Plaid paper and adhere it across the bottom of the page. Cut a 7cm strip of Patchwork Chocolate Plaid paper. Tear approximately 1cm off the bottom edge, as shown in the layout above. Adhere across the top of the page. Cut a 5cm strip of KI Chic paper. Adhere across the page approximately 0.7cm from the bottom edge. Cut a 9cm strip of Chatterbox Bunkhouse Ranch Flowers paper. Adhere across the page approximately 11.5cm from the bottom edge. Cut two pieces of brown plaid ribbon, each just over 31cm long. Adhere one across the top of the page approximately 1cm from the top edge. Adhere the other across the top of the strip of KI Chic paper, as shown in the layout above. 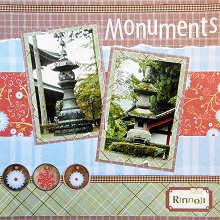 Mat two 4x6 photos with KI Chic paper. Run the edge of a pair of scissors along the edges of each mat to give a distressed look (you will end up with a white edge). Make a small tear on one edge and fold a small section over, as shown in the layout. Repeat along each edge of each photo mat. Mat your photos again with Patchwork Chocolate Plaid paper. Adhere the photo at an angle towards to top left corner of the page, as shown in the layout above. Adhere the second photo at the opposite angle towards the bottom right corner of the page, as shown in the layout above. Place three circle tags from Pebbles Inc Antique Circle Tags stickers along the left side of the ribbon underneath the photos. Cut out three flowers from Chatterbox Bunkhouse Ranch Flowers paper and adhere one on each circle tag. Also place a brown brad through the hole in each circle tag. Use Doodlebug Designs Lily White Alphabet stickers to adhere your title in the top right corner of your page, as shown in the layout above. Place the plaque shaped sticker from Pebbles Inc Make A Wish Accents stickers in the bottom right corner of the page. I have used green alphabet stickers on the plaque to give a location. You can either use your plaque in a similar fashion or to add journaling.